Old Faithful was named by the first official expedition to Yellowstone, the Washburn Expedition of 1870. They were impressed by its size and frequency. Old Faithful erupts every 35 to 120 minutes for 1 1/2 to 5 minutes. Its maximum height ranges from 90 to 184 feet. It is not the biggest or the most regular geyser in Yellowstone but it is the biggest regular geyser. Furthermore, it has been erupting in nearly the same fashion throughout the recorded history of the park. Through the years, it has become one of the most studied geysers. One result of this close observation is that the Park Rangers are able to predict its eruptions fairly accurately. This makes Old Faithful geyser one of the easiest geysers in Yellowstone to see. Old Faithful’s intervals range from 35 minutes to 2 hours. You might see one interval of 60 minutes but it is very unlikely that you will see two in a row. This misconception seem to date back to the 1870 Washburn expedition where one of the members reported that Old Faithful played “nearly hourly”. Each day there are usually between 21 and 23 eruptions so “nearly hourly” is about true if you look at the average but on an eruption to eruption basis, hourly eruptions have never been the norm. No geyser, including Old Faithful, plays at set times and intervals. There is always some variation. People expecting an hourly eruption are often surprised when they have to wait through a 90 minute to 2 hour interval. They then think that Old Faithful is slowing down. Old Faithful still has its same interval range, 35-120 minutes, that it has always had. In the last few years, long interval eruptions have been a little more common than they were a few decades so the yearly average has increased by a few minutes over what it was a few decades ago but this change is very small and the range of intervals is still the same. Measurements show that Old Faithful is still as tall as it has ever been, 90-180 feet. There are a number of reasons people may feel that Old Faithful is getting shorter. They may have seen an exceptionally tall eruption last time and this time saw a more ordinary or even a short eruption. The first time they saw an eruption they may have been more excited and their excitement caused them to over estimate its height. Or they may have first seen it a number of years ago when it was possible to get closer to the geyser. 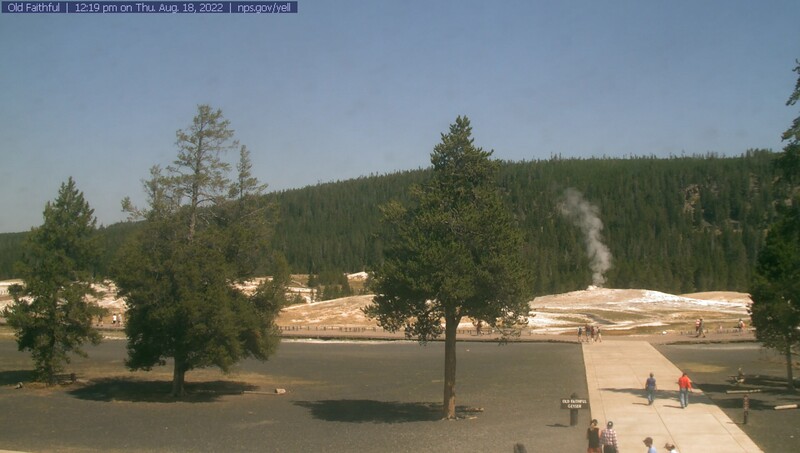 To accommodate the summer crowds, the boardwalk has since been moved further back from Old Faithful. Many people don’t realize just how far from the geyser the boardwalk is. With nothing to judge the distance by, most people severely underestimate the height of Old Faithful. Its not until they get back farther from the geyser and see the buildings around the geyser that they realize just how big the geyser is. A joke among some geyser gazers, when asked in the summer by a park visitor about when Old Faithful will next erupt, is to ask the visitor about the “Old Faithful Indicator.” Of course, there is no Old Faithful indicator in the true sense of the idea. What the geyser gazer is actually referring to is the crowd seated around Old Faithful. After the eruption everyone leaves. As the predicted time for the next eruption approaches, the benches begin to fill and eventually overflow. Thus, by looking at the crowd, you can get a rough idea as to when the next eruption is predicted. If the indicator is broken, say you are lucky enough to be in the park when there are no crowds, then you’ll have to look at the geyser. Old Faithful goes through a period of preplay prior to an eruption. This preplay can last anywhere up to twenty minutes. The preplay consist of splashing and small jetting which often occurs every few minutes reaching from 1 to (rarely)20 feet in height. It often lasts just long enough for some excited visitors to start taking pictures. The eruption usually starts from what initially looks like just another preplay jet. Short interval eruptions occasionally start with the first splash seen above the cone but most require a period of preplay. Once the eruption starts, the jetting will grow, stop, grow again and in two or three of these steps, reach maximum height. It takes 10-20 seconds to reach full height. Unfortunately, the full height is maintained only for a short time. Within a minute, the eruption starts waning. This is the when you need to pay close attention if you want to predict the next eruption. The interval to the next eruption is based on the total duration of the current eruption. This includes the unimpressive play that ends the eruption. The main visible difference between a long and short eruption is the duration of the end play. In a short duration eruption the end play stops quickly. In a long duration eruption you may see up to 4 minutes of unimpressive, 5 feet tall, end play. It just doesn’t seem fair that a long wait is due to such wimpy play.